I could not believe the temperature early this morning… just 48 F according to my weather station. I don’t know if that set a record or not but it sure seemed cold for August. 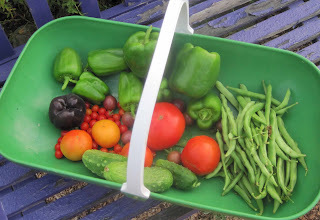 I had just enough time to run out to the garden and pick a few tomatoes, peppers, cucumbers, and green beans because my siblings and I had a surprise 80th birthday party for my mom today. We invited friends, neighbors, and relatives and had a nice turnout. She had a great time, too, and was pleasantly surprised. Some of my uncles who always have nice vegetables gardens came, so I got to talk to them and compare notes. They live in southern Indiana so have a few more weeks in their growing season compared to me. The first thing we talked about was how terrible our tomato plants look. I don’t know if you’ve noticed, but I haven’t posted any pictures of mine this year. That’s because they do look rather pathetic, even though I am getting some tomatoes from them. The plants don’t have the late blight that kills the entire plant in a matter of days, but they seem to be full of brown leaves and just generally look like they definitely do not like the cool, wet summer we are having. We all agreed that at the end of the season we are going to throw the plants out in the trash and not put them in the compost bin, just to be sure we limit the spread of any disease as best we can. My one uncle who grows his tomatoes in containers is going to start over with fresh soil next spring. They also talked about how their okra plants looked like they were dying for awhile, but have perked up in the last few weeks so they are getting a good harvest now. My uncle prefers a variety called ‘Emerald Green’ or just ‘Emerald’. Of course, now I want to try to grow okra next year, even though I’m not sure if I really like it or not. We also talked about a tomato called Fantastic that is one of their favorites, but they had trouble finding seed for it this year. It looks like Territorial Seeds has it, so I’m adding it to my list for next year, too. I’m always willing to try a new tomato variety. Goodness, I can’t believe I’m already talking about next year’s garden while this year’s is still producing. 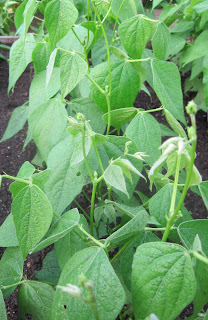 In fact, the last crop of green beans, pictured above, should be ready to pick around the third week of September. I hope we don’t have an early frost! P.S. Here’s a quick picture of the garden taken this morning. I don’t think much has changed since last week, though those cucumber vines in the bottom of the picture look pretty bad. I think I’ll pull those out this week. P.S.S. If you want to tweet a Happy Birthday to my mom on Twitter, use the hashtag #Eleanors80th. Her actual birthday is this Wednesday, the 2nd. I'll have to figure out how to explain "Twitter" to her! My peppers look like they're going to explode with new fruit; they've got tons of flower buds. And all I can think is "NOW?!! When it seems like frost is coming any day??" So strange! Sorry to hear your tomatoes look bad. I think it's a good idea to throw out the old plants and take lots of precautions against spreading disease after this goofy summer. Wow, it was colder at your place than mine this morning. I've been thinking about frost too, and about next year's garden. Fall is on our doorsteps. Wow, that was cold! Meanwhile, it was over 100 here in Central CA, also a bit unusual. Fortunately, it's back down to the 70s today. Consider setting up an indoor garden with hydroponic gardening. That way, you don't have to worry about the weather. 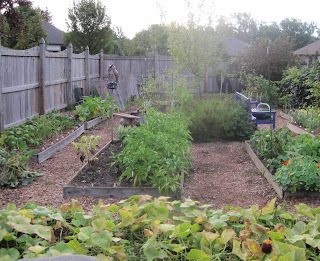 You can grow your favorite fruits and vegetable all year round. It is cheap to set up a hydroponic garden. Wow, that is chilly when I convert it to Celsius! Your cucumbers won't look any better after a cold night like that, so I hope there are a few hiding under the leaves for you. And very happy birthday wishes to your mother! Our veggies did not produce well at all. We are working on our fall garden now, started a small salad garden yesterday..
thanks for the tomato site. I ordered a catalog. The nights have been cold here in Mass. too. Last night our weather station said 47 degrees. I don't Tweet, but Happy Birthday to your mom.